Writing is a passion for me, but, as a novelist, my blogging seems to have taken a back seat. A friend and I have been meeting to discuss how we’re going to get back to blogging and doing videos regularly. I have lots of old posts with lists for blogging ideas, so I filtered and combined them to come up with hundreds of ideas to get your creative juices flowing. That is actually my favorite blogging/video idea: going through old posts and giving them a fresh face or reworking them. Don’t forget, you are the expert here. Share your knowledge and expertise as though we were sitting down over coffee and you were telling me a story. Let your personality and authenticity come through in your writing. You don’t need to use these like they’re written; let them jump-start your creativity and activate your imagination for different posts. If you can’t find something to write about here, I’m afraid you may be in the wrong place. Best of luck, and please be sure to add your ideas in the Comments section below. I’ll add them into the post if it’s not already here. As you think of new and exciting things to write about, here’s a link to how I personally keep track of ideas. Don’t forget the old adage, “You’ll never plow a field by turning it over in your mind.” Happy writing! Write about a current listing, even if it’s not your own. What are your favorite business strategies? What areas of your town are selling? What is your best form of advertising? What should your buyers be looking for during an inspection? Do you have Realtor designations? Explain what they mean. Write about the local listings on the market for the longest time. Why do you think they haven’t sold? Why now is a good time to buy. Why now is a good time to sell. Make a top 10 list for preparing for an open house. Make a top 10 list for sellers preparing to put their house on the market. Make a top 10 list for sellers before they move. Three mistakes you’ve made in business (or personally). What trends are you seeing in your current market? According to … here is a current HOT trend. Does your state require CO2 detectors? Write a post about why people might not want to own a home. What do you do that is different from other agents? If you were teaching a new Realtor, what do they absolutely have to know? Dumbest offers — ones you’ve made or received. Take photos and write a post about the most expensive house that sold in your city last month. Write a post about the three (or five or 10) most expensive houses on the market right now. What do you need to change about your business? Besides referrals, where does most of your business come from? The sale/deal/job that makes you most proud. Give us your elevator speech. What deal do you remember that makes you proud (or sad or embarrassed)? On the last deal you lost, what could you have done differently? Make a list of things NOT to do when selling a house. What are the LIFESTYLE keywords for your niche market? Tell a newbie how to do something on ActiveRain. How has real estate changed since you started? Without naming names, tell about how a Realtor made a deal difficult. What are your favorite techie gadgets? What are your favorite closings gifts to give or that you’ve seen? New gadgets you’ve discovered in homes that we should know about. Make a post with five houses available in your market with incredible views. Write about the six largest houses on the market in your area. Tell us about your most difficult/embarrassing deal. Tell a funny story about an off-the-wall client. Share one of your checklists. A common line you use when showing a house. What contact management system do you use? Do you like it or not? Tell about a good/bad listing experience. Tell about a good/bad buying experience. Tell about an unusual/famous/demanding client. Tell us why you like the company you work for. What are closing costs? Who pays them? How do you keep track of your TO-DO tasks? Do you provide services to unrepresented sellers (FSBOs)? Are you successful with them? Do you work with expired listings? Are you successful with them? How do you help your clients get their home ready for sale? Make a list of what you do differently than your competition. Set a goal to get one video done — plan it out. How is your work different in the different seasons? Write about your communities — one at a time. New construction vs. established homes. Do you take the first offer seriously? The pitfalls of pricing too high. 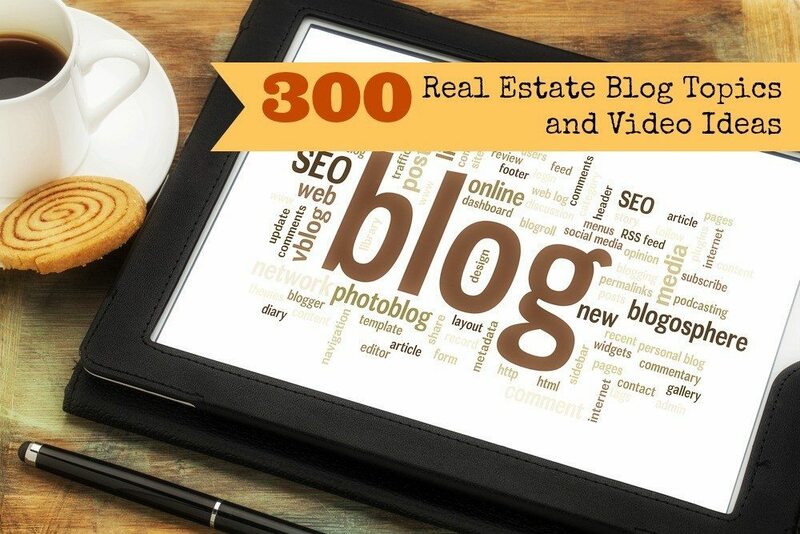 Find questions on Trulia/Zillow/realtor.com and blog an answer in 500 words or less. Do that with multiple, often-asked questions. How do you handle a final walk-through with a client? Do you use a checklist? Tell about a Realtor who should look for a new job. Write about a recent sale. What are you going to change about your business next year? Why you do or don’t do short sales. Explain to sellers how to stage their home before putting it on the market. What can your sellers expect during the sales process? What can your buyers expect during the sales process? Write a testimonial about a great client. What is the difference between a short sale and a loan modification? Share a testimonial and why they liked you so much. What do you think of when you think of your favorite clients? Why? When you’re done with 2014, what five things do you want to have accomplished? What worked for you this year? What didn’t? What other job would you want if you didn’t do what you do? Do days on market matter? Do you have a niche? Tell us about it. Write about a business in your niche. Tell prospective clients in your niche why they should hire you. Five best steak/burger places in town. Take pictures of the meals. Write about 10 “happy hours” in town that are worth visiting. Write about the oldest houses in your area. Include pictures. What was your favorite house (personal, shown, sold)? Why? Write about an uncooperative Realtor. What did another agent do that made a difference in a deal? Is there something you want to try in your job (e.g., video)? Make a plan. Why is there a difference between the assessed value and list price? Do you work as a transaction roker or a buyer’s agent? Why? Can a buyer switch agents if they don’t like their first one? What do you do to “get back in the game” when business slows down? When are you most productive? Is that when you work? Why or why not? How many buyers purchase the type of house they originally wanted? Which services providers do you love? Best buys in your niche market. What is your best marketing tool? Home improvement ideas that pay off. New laws in your state concerning real estate. Tell a tale of a funny/strange/dangerous house showing or closing. Tell us about YOU — a new designation, a testimonial, an award. Overall summary of your city. Share the history of your town. Take a photo of a local statue and tell us about it. Write about your favorite restaurant with pictures. Tell us about a new business opening. Tell us about an established business closing. What industry fuels your local economy? Tell about local tourist attractions. As a local, something you want tourists to know. Is your downtown area thriving or dying? Make a list of five (10, 15) things you love about your city. Write about a local college/university and how it impacts life around it. Tour your downtown area — video? Write about the top 10 golf courses in your city. Include some photos. Interview the owner of your favorite store(s) — send them a copy. Tell an interesting history lesson about your town. Where is the best place in town to hike? Find the best ice cream or candy shops and write about them. Show us the oldest house in your city. Where do locals take their kids to play? Tell us about your favorite coffee shop. Who was your town’s founder? Why would I want to visit your city? Visit a local museum — take us with you. Tell about a local skating rink. Does your city have any natural features? Tell about a store where you like to hang out. Share a story you tell tourists. Make a post of 50 resources for people relocating to your city. Compile links to area attractions, dining, hotels, museums, etc. Create a list (with a few photos) of the 10 best parks in your area. Do you have any castles in your city? Tell about a local art gallery. Is there a military base in your town? Are you home to a sports team? What industry supports your town? Write about it. Is there something unique about your city? Tell about a “different” store you want people to know about. Do you have an old or funky or fun section of your city? Write about one or more local neighborhoods. Tell about a local brewery. Where do you go in your town to escape/relax? People like stats — give them (honest) ones. Do you have a designated driver program in your town? Write about it. Do you have a railroad in your city? Do you have a mass transit system in your town? Describe. Announce a local promotion or sale. Write about an upcoming local event. Write a “series” on coffee shops, restaurants, theaters, book stores, etc. Special places to go in town. Free and inexpensive places to take kids. Stories you tell out-of-town visitors. Local parks — what are the 10 best? Do you have a local Murder Mystery Theater? Does your city host an annual event? Tell about a walking tour. Tell about a nearby town/suburb. Write about a wonderful customer service experience you’ve had. Tell about the history of a local cemetery. Where are the most romantic places in town to propose? Seven best pizza places in town. Write about a historic local building. Is there a family fun center in your town? Tell about a local nature center. What business closed that you wish was still open? What is the best place to get married in your town? Do you have a dinosaur museum? Show me. Tell about one or more local malls. Famous local celebrity — good or bad. Do you have a performing arts center? Tell us about a local teen hangout. Tell us where some local campgrounds are. Do you have local music festivals? Tell us about a local spice store. Your local zoo — do a video and/or story. Where is Santa going to be for children? Where is the best area to see Christmas lights? Tell about a farmers market. Most romantic restaurants for Valentine’s Day. How to prepare your lawn/house for winter. How to prepare for spring. Walk through different neighborhoods; take photos and write about the area. Review a game your family likes to play. Write about a recent loss. Write/teach about something you know how to do well. Tell about a time you were betrayed. A magical moment in your life. What scares you — rationally or irrationally? Who would you like to kick and why? What do you want to make sure your children know? What are your hobbies? Let your clients get to know you. Where do you like to write and why? Tell about “talking someone down from a ledge” to calm them when they were desperate. What’s your biggest fault in getting your job done? When is a time you wish you had listened better? When did you help someone and it backfired? Tell us about your favorite car. Tell about someone whose life you made a difference in. If you lost someone you loved today, what would you regret you hadn’t done? Fix it! What was the best class you took? Do you self-sabotage? Can you change it? How would a cellphone in the ’60s ’70s or ’80s have changed your life? A story you or your family tell often. What is your favorite holiday? Why? Tell about family traditions. People who moved on — either in death or by leaving. An interesting character in your life — then or now. Where would you live if you could live anywhere? Why don’t you? Where were you when John Kennedy (or someone famous) was killed? Review a gadget you love. Have you read a good book lately? Write a review (I can recommend one LOL). Make a top 10 list of things you like. Make a top 10 list of things you don’t like. An expression, book, or painting you love — how does it make you feel? Are you part of a business network (BNI)? Has it been profitable for you? Tips and tricks on something you’re good at. Did you ever notice …? What one thing do you want to learn in the next month? How are you going to do it? Don’t forget, people want to learn about who you really are. Give them some insight. This post by Mimi Foster, managing broker with EPIC Real Estate Group, was originally published on ActiveRain.